The most cultivated and inmportant grape variety of Bordeaux region, Merlot is often associated to great wines of Saint Émilion and Pomeral. It is a fragile grape, sensible to dryness as well as cold. 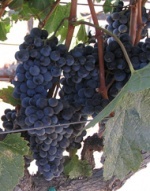 A Merlot wine has a medium red colour, a strong fruity aroma. Soft, rich, well balanced, silky and great classy taste. Merlot is generally enjoyed young. Merlot is, all over the world, blended with Cabernet Sauvignon. Châteu Pétrus, one of the most costly and refined wines of the world, is 95% or more Merlot.